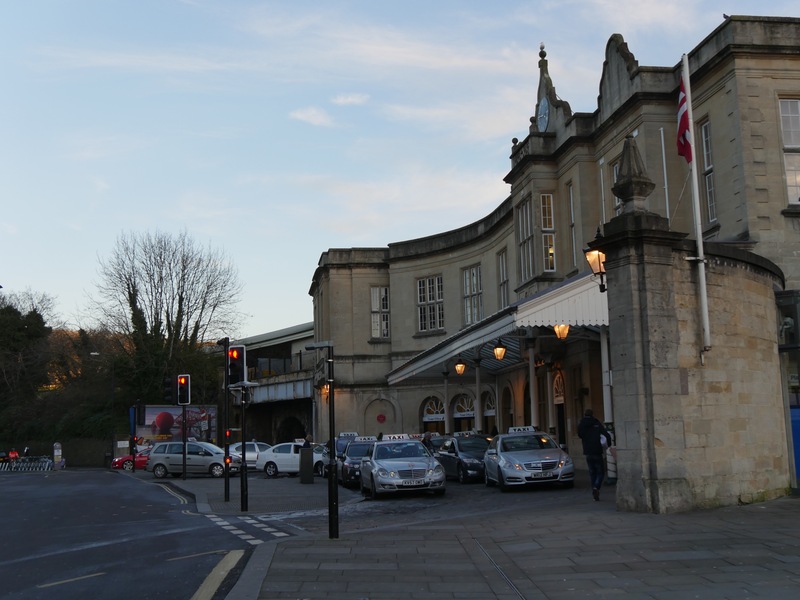 At 5.41 am on Tuesday, September the First – a train left Bath Spa for Chippenham. Not only was it the first train movement of the day on this Bristol to London line but the first to make the journey up the track – and through Box Tunnel – since Network Rail closed this part of the rail route to the east six weeks ago. 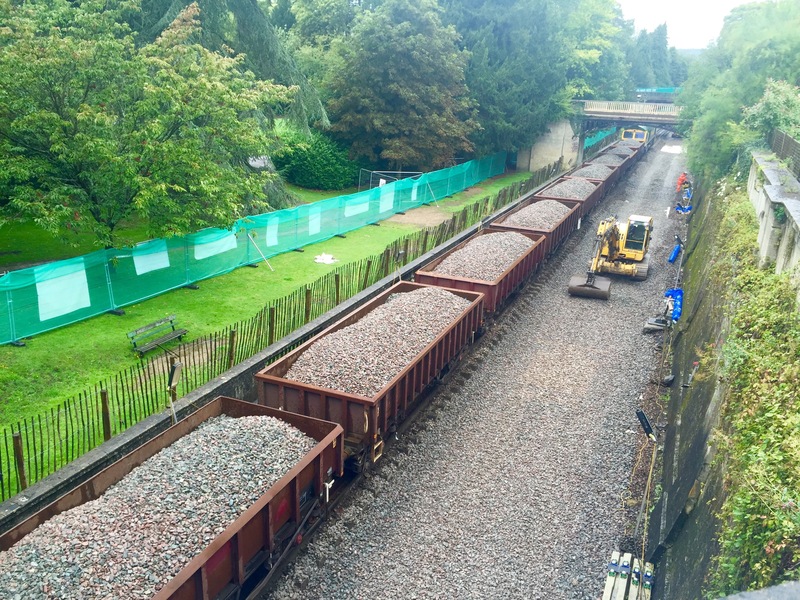 New ballast arriving in Sydney Gardens. sections of the track and renew drains, ballast and a lot of actual railway as part of the multi-billion electrification scheme that will see new faster and cleaner rolling stock ferrying passengers to and fro from the capital on what was Isambard Kingdom Brunel’s Great Western Railway line. That’s me on the right chatting to Consultant Civil Engineer John Buxton. A few days ago l was allowed on to that closed section where – suitably outfitted as a temporary member of the ‘orange army’ – the highly visible colour of the safety clothes they wear – l was able to walk into what was once – at nearly two miles in length – the longest tunnel in the world. The clothing, steel re-inforced boots and hard hat are all part of the modern-day safety requirements demanded to work on such a potentially dangerous site where – although the line is closed to passenger traffic – various line and ballast laying machinery is still trundling up and down. Construction workers pose for a “Brunel shot” as a tribute to the original engineer. From what is known as the Shockerwick Compound – after being kitted out and sitting through a ‘safety presentation’ – l was driven down to Box. Leaving behind me a real feeling amongst these engineers that the job was coming to an end. 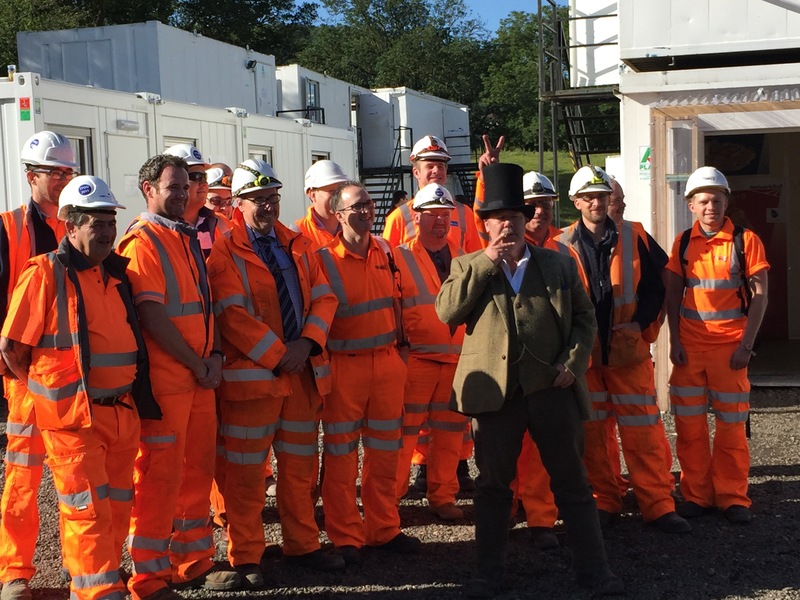 One of the senior site officials, Andy Musgrave – complete with stove pipe hat and smoking cigar – lined up in front of his friends and working colleagues for an ‘end of term’ group photo. 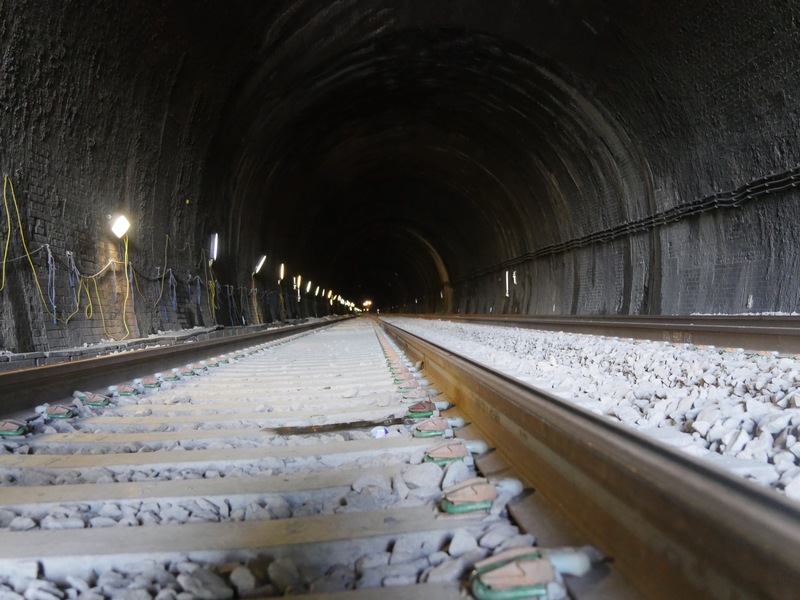 It’s been a tough job to complete on schedule but you cannot help thinking of how much tougher it must have been for the men and animals that actually blasted the Box Tunnel – and its little Middle Hill companion – out of the rock at Box. It was going to be a long and hot trudge along the newly laid ballast towards the two tunnels. 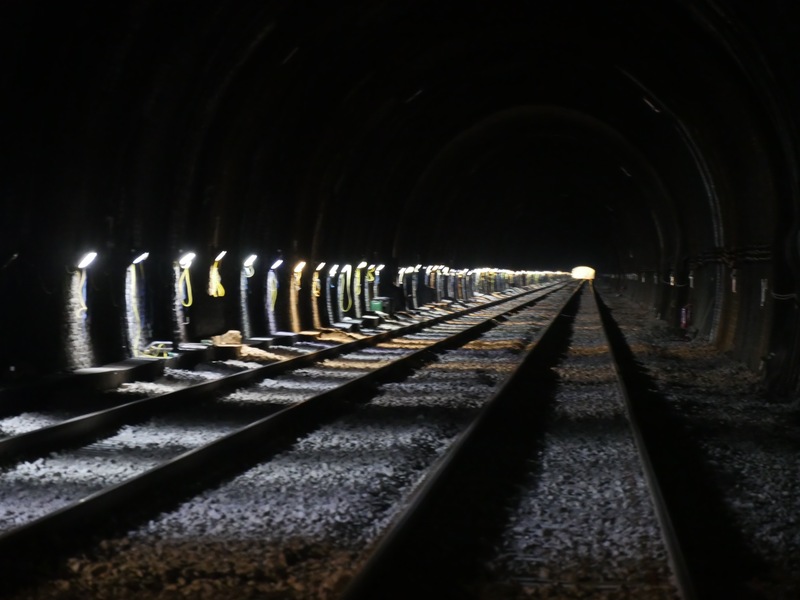 Trudging towards the tunnels – across newly-laid ballast – was like trying to walk in heavy boots across Brighton’s pebble beach but there was plenty to see to take your mind off the journey. 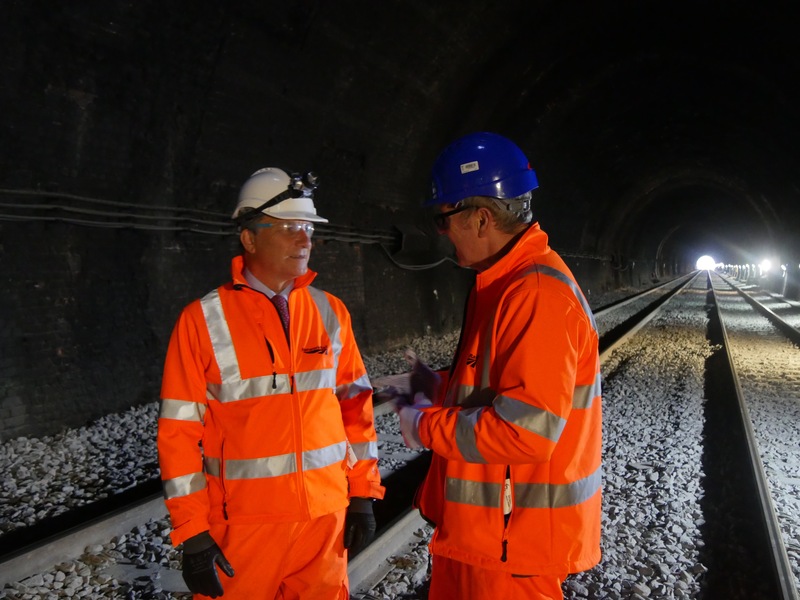 I had Network Rail’s consultant John Buxton for company – he has his own civil engineering consultancy company (Cambrian Transport Ltd) and has known Box Tunnel for many years – stretching back to the days of British Rail. Re-erecting some of the sound deadening fencing that had been blown over. 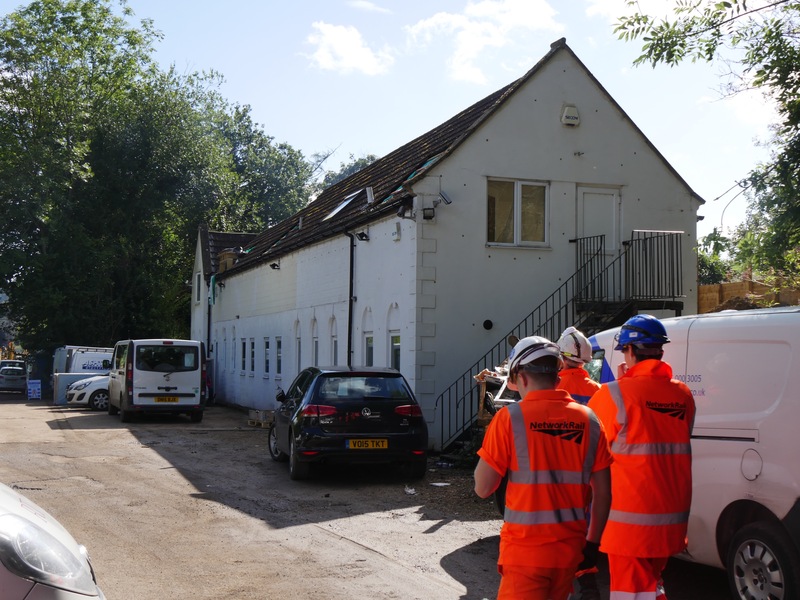 We passed some of the barriers that had been erected to try to muffle the noise of operations and where the wind had blown down a section which the contractors were now re-erecting – and on past the remains of Box Station – a little white-painted Victorian building at the side of the track. The old Box Station building. It was a short walk through the Middle Hill tunnel. It’s only 198 yards long but its entrance portals are pretty impressive – though l was getting a better view than a passenger in a hi-speed train would have! The Bath-stone clad entrance are richly carved and the tunnel flanked by pilasters decorated with fasces – an architectural feature derived from the bundle of rods carried before a high-ranking Roman magistrate. The tunnel through Middle Hill showing the fasces either side of the portal entrance. According to rail and local historian Andrew Swift in his fascinating book “The Ringing Grooves of Change” this may have been a subliminal Brunel message. Box Hill though was the biggest obstacle on the route to London and one Brunel decided he would tunnel through. It was constructed between September 1836 and June 1841. Between 1100 and 4,000 men were employed on the job – and around one hundred of them would die working on it. Inside Box Tunnel. Click on images to enlarge. More than three hundred horses laboured – many walking around in circles – drawing the excavated material to the surface through numerous shafts that had been sunk along the line of the proposed tunnel. A ton of dynamite and a ton of candles was used every week while something like 247,000 cubic yards of stone was removed. Some of it no doubt used to create the impressive ‘triumphant’ archways erected at both the west and east entrances to the tunnel. 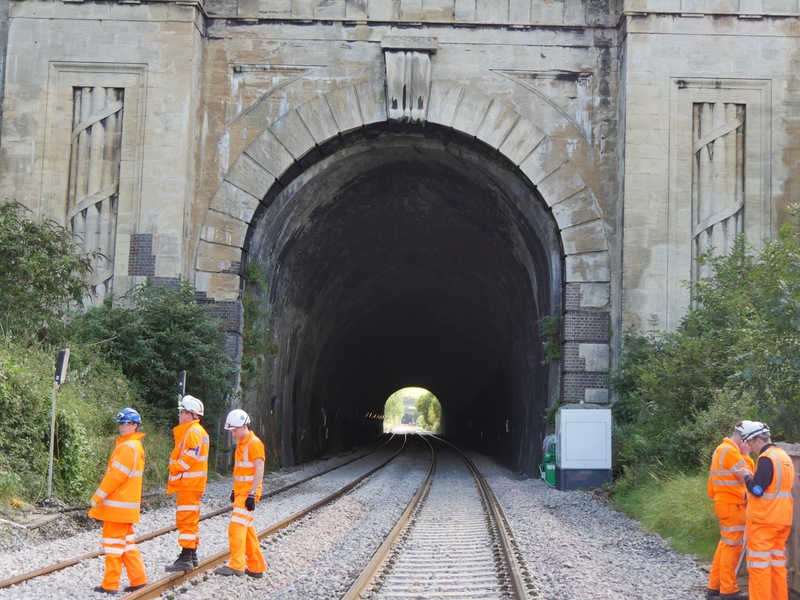 Brunel was not the first to tunnel in that hill – Bath stone – oolite limestone – was being worked in underground quarries beside the route he chose through this mighty obstacle on his iron road to London. It was the quarry workers he called in to help him with his tunnelling and even built a smaller tunnel under his tunnel for them. Part of the deal was to allow the stone works to continue in the hill on the other side of the track – though they never in fact went this far and the ‘subway’ has now been filled in. Those stone quarry tunnels became an aircraft factory during the war and a proposed refuge for government and Royal Family in the event of a nuclear war. There were no lights in the tunnel in Brunel’s day! It was a very weird feeling to be standing in the middle of this train tunnel and at a point where l could see light in the distance coming through the East portal towards London. 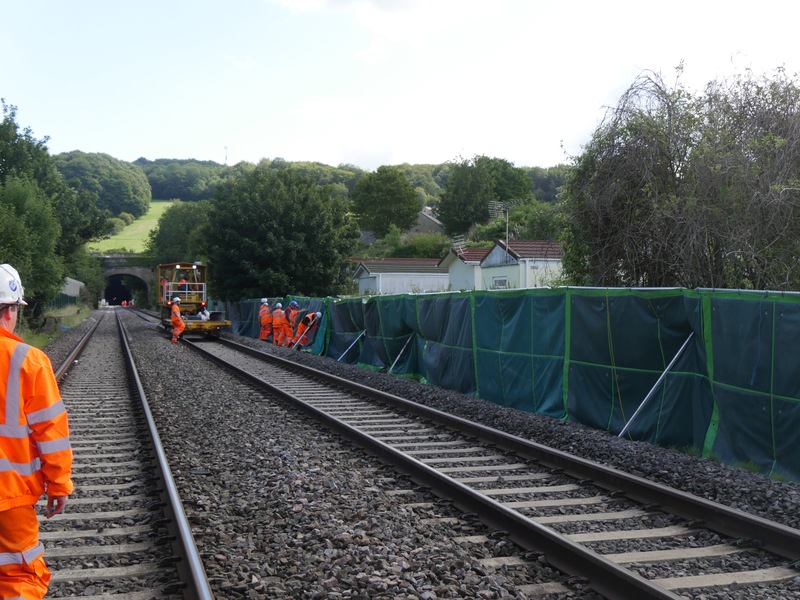 John told me Network Rail had only had to reduce the track level nearest the east entrance – athough ballast and track had been replaced. The line is now even straighter than it was in Brunel’s day. 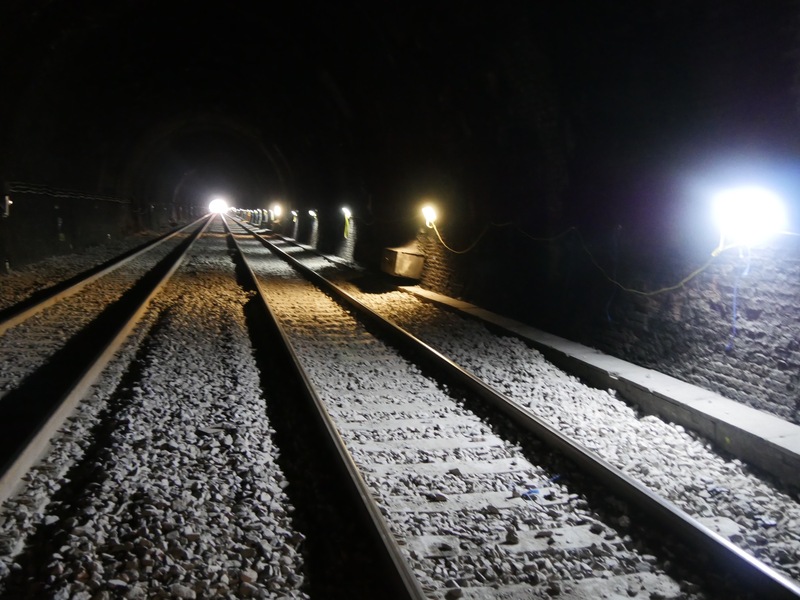 The tunnel was dug wider than it might have needed to be because of Brunel’s broad gauge lines – but at least it’s given modern-day engineers more room to play with. The tunnel is 30 feet wide and varies in height from 25 to nearly 40 feet. You have something like 300 feet of hill above your head at its deepest point. Part of the sensor equipment to check for movement. 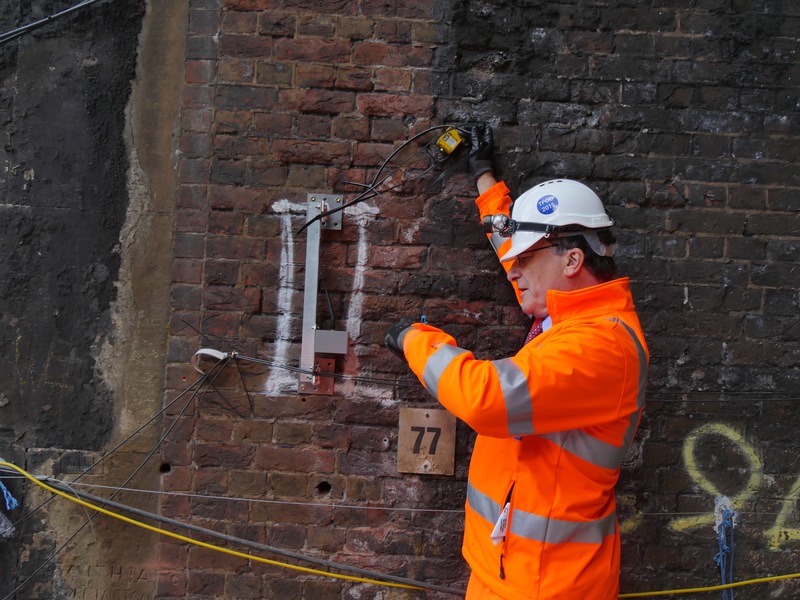 John showed me sensors that had been installed to check on movement during the work and also we stood beneath one of the ventilation shafts Brunel had installed to take fumes out of the tunnel. There is still plenty of soot lining the walls from the age of steam. 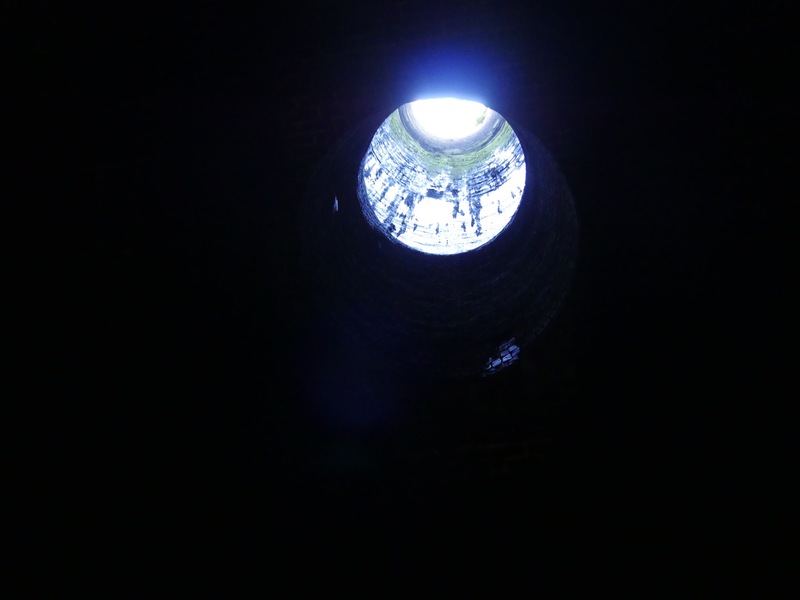 Looking up around 150 feet through one of the ventilation shafts. There are six ventilation shafts but many more hidden shafts which were dug by Brunel’s men to check the geological composition of the hill and also so they could excavate out at either side of the bottom of these bore holes. Some parts of the tunnel were left as bare rock but around 30 million locally-made bricks were used elsewhere on lining this subterranean route. The east portal is just visible in the distance! You can imagine the horror on the faces of passengers entering this dark and smoke-filled tunnel in the early days of the Great Western Railway. It must have felt like a gate to hell for those sitting in carriage with no lights and – of course – third class sitting in open wagons. There were those who thought you were sure to suffocate or be crushed by a cave in. Many got off at Box and into carriages to take them around to the other side of the tunnel to catch the next train passing through. It’s remarkable that something built so long ago should still be in ‘active service’ today! Once out in sunshine again l had a chance to ask John exactly what work had been carried out here. 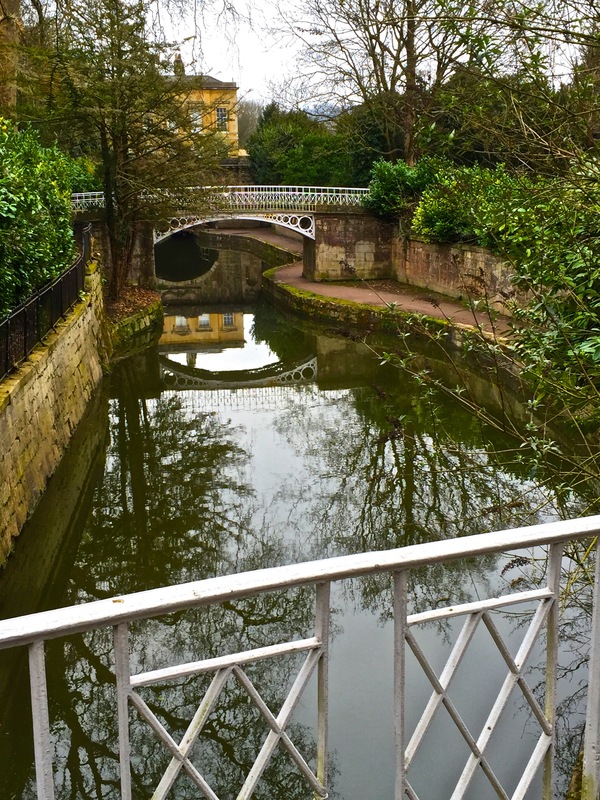 The canal as it passes through Sydney Gardens. 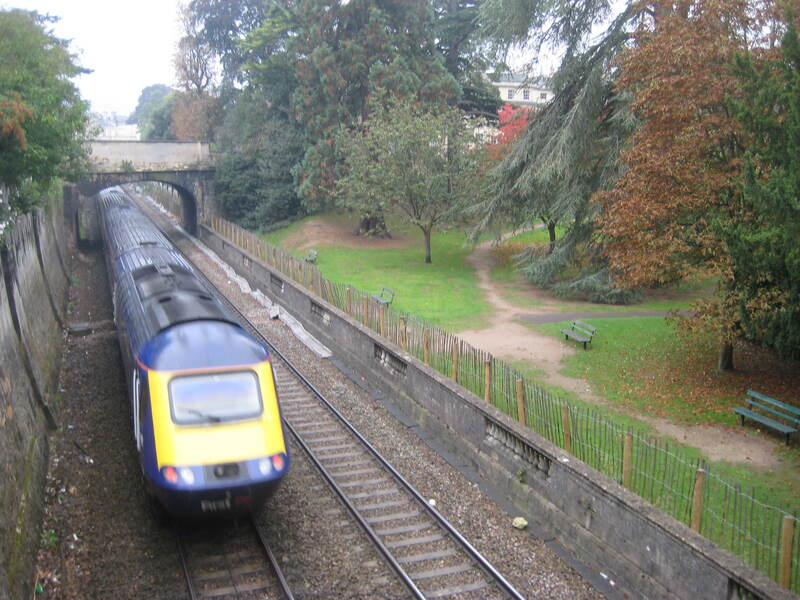 My visit to Box Tunnel was followed by a trip to Sydney Gardens in the centre of Bath – the last remnant of a Georgian pleasure garden or Vauxhall. In its time it’s been crossed by two forms of transport regarded as cutting-edge technology in their day. The line of the Kennet and Avon Canal ( John Rennie 1799) was the first thing to truncate the pleasure gardens. Followed in1841 by Brunel’s Great Western Railway. Both engineers though had sought to make features of their transport routes where they crossed the park. Where you could watch the trains passing by. In Brunel’s case he shaped the land so the park was like the auditorium of a theatre where people could watch his marvellous steam engines hurtle in from the wings and cross a ‘stage’ before disappearing out of sight on their way to London Paddington. The big fear now has been that all that accessibility would disappear once high voltage has to be strung along the side of the track. 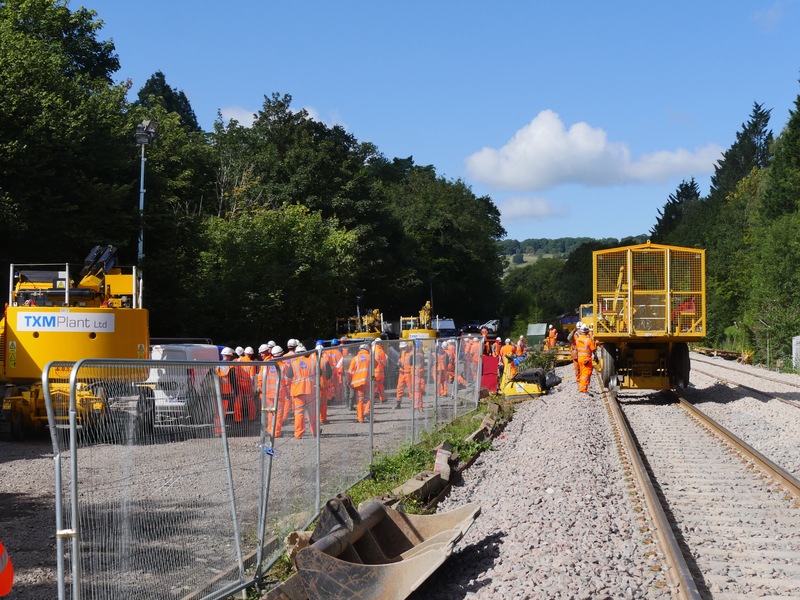 Bath passengers get their railway back next month but there will be more disruption to come this year and next as the poles for the power cable are gradually erected down the line. Seems Sydney Gardens now won’t get a sloping ditch but some sort of barrier on top or or alongside the existing wall. This has yet to be agreed with B&NES. I think Brunel would have loved all of this ‘upgrading’ of his line. You could almost smell his cigar! Many thanks for this excellent and informative article. Having grown up in Box I’ve always been fascinated by the tunnel and railway “skirting” our village, and had the opportunity during a recent visit to witness some of the action and take photos of what was going on. I was also wondering why there seemed to be very little change in track height at the West portal, John’s explanation solved this! One point which you may have omitted is about the height of the Western portal; it was made higher by Brunel to avert fears of passengers in the early days but slopes down steeply straight away to “normal” tunnel height. The Eastern portal at Corsham is a simple-but-strong brick-built affair and hardly ever gets mentioned! I look forward to taking a trip through the tunnel when the electrics enter service!